The love affair with German Shepherds begun way back in the early 1980's. In 1987 my beloved grandmother Irene who was German so it must be in my blood, said I think Boss needs a playmate. After many calls to find that special puppy we contacted Keevale Kennels.Jan had a litter from the new German Import Vasall vom Kirschental, we were able to get second pick from the litter. Ch Keevale Olga or Alexis was a girl well before her time as she was very different to the current dogs in the ring at the time. However Alexis is did quite well in the show but she was to be the foundation of Freevale & what a strong foundation she has given, thank-you Alexis. Her trademark is still within Freevale today, that is the stunning deep red that is the envy of many. Ch Cassvale Living Legend or Razz. Razz was a multi Best In Show winner, winning many top awards over the years. So that is the past of Freevale now onto Freevale of today. In 1996 was the birth of the outstanding Grand Champion Freevale Magnum Force or Dillon. Dillon has made some records that will be very hard to better. A true showman in every way & is today behind many lovely show winning dogs. Here at Freevale we will always give Dillon the credit that is due to him with what he has produce for us. In 2002 I met Matthew who shares the same love of German Shepherds, together we now bred under the Freevale prefix. On December the 2nd 2006 we married which our day was shared with family & friends. Of course our wonderful boy Dillon was in the wedding party & did me the very special honor of walking me down with my parents Daryl & Bronya. In 2002 we imported Sam vom Zellergrund from Germany & in 2008 we have imported Jolly vom Thermodos. We hope to import others in the years to come. 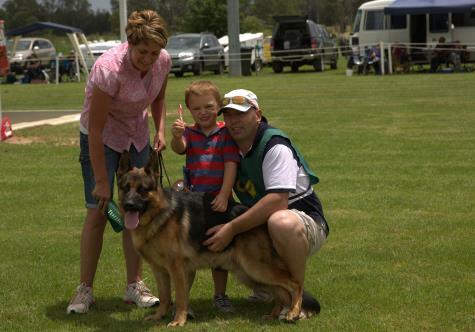 Freevale is a leading German Shepherd kennel, to date we have bred four Grand Champions the ONLY breeder in Australia to do so. We are the breeder of five times Best Of Breed winner SYDNEY ROYAL again the ONLY breeder or dog to ever do this, in fact Freevale is the most successful breeder at the Sydney Royal winning Best Of Breed German Shepherd yet again 2006!!!! Freevale has been the breeder of the Best Of Breed winner for Seven years at the Sydney Royal again the only breeder to do so. Grand Champion Freevale Cross My Heart wins NSW TOP SHOW DOG OF THE YEAR 2007. We are now importing top bloodlines from Germany with Ch Sam vom Zellergrund & Jolly vom Thermodos to give Freevale the best German lines today. Freevale lines are behind many award winning dogs, this goes to show the producing lines that we have & others have been able to benefit from our lines & without our lines they would not be where they are today! Freevale kennels also have a long time connection with Dr Robert Zammit (Burkes Backyard vet). Robert co/owns some of the top winning dogs also takes excellent care of the team. All Freevale dogs are conditioned on Royal Canin keeping them in top show condition. Our current show dogs are consistent winners showing that from careful well planned breeding top dogs are bred. We take great care when we breed our litters & as the saying goes the proof is in the pudding. Our puppies are only sold to loving homes to be well loved family members. We hope you enjoy our site & our gorgeous German Shepherds.